Cinema screen grab of a vehicle which appeared in an American TV film " A Child's Christmas in Wales " made in 1987 where the vehicles are being investigated by IMCDB. The film is about a little boy whose Grandfather gives him an old snow globe and tells him a story. -- The car is French, made in Paris, by Gustave Adolphe Clément who was in world's fist motor racing car in 1894. Made bicycles and cars. 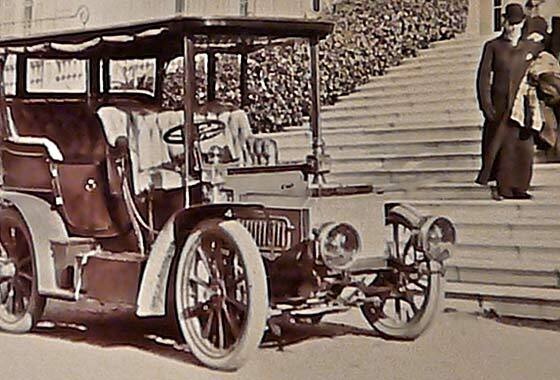 This was one of his earliest being a cca 1903 Clement 14hp R. Entrance Tonneau. A couple of lovely photos received from Peter Webster from Cheadle Hulme (UK) saying he is researching his family history and has come across this photo of his (very young) grandmother in a vehicle in the yard of Walter Munn, Belfast, Northern Ireland, circa 1910ish. --RI 423 is a Dublin CBC Registration, although Belfast did have their own. 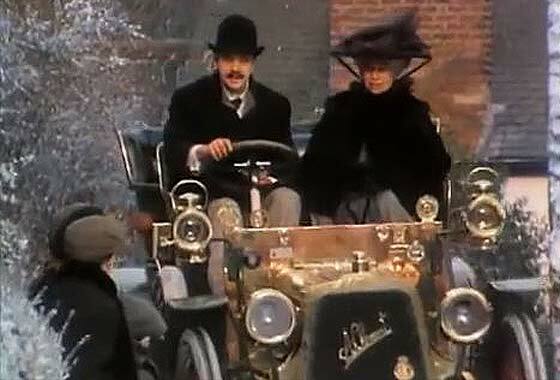 The car is relatively easity recognisable by the distinctive wrap-around radiator cooling tube system and is cca 1904 Wolseley 6HP Two-Seater. 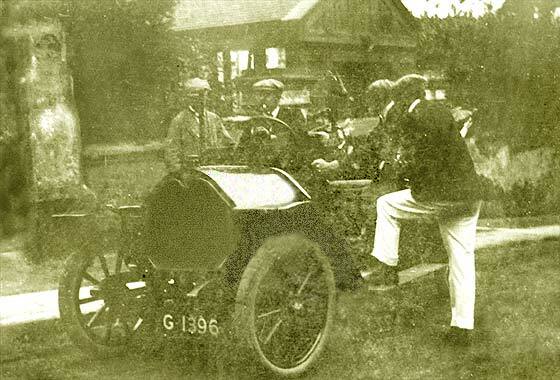 A blurry photo posted by Hillstart (UK) on the AACA Forum of a car taken in UK in 1900, - but then corrected to Monte Carlo in 1908. -- In the UK without numberplate car would be pre 1903; and this is bit later. Various cars had similar header tanks in period including the French Peugeot, but these were without louvers until '05. The header tank is relatively short which limits choice and makes the closest match to be a cca 1905 Peugeot Model 72, 4 cylinder 3.6 litres, with a 'Surrey Top'. 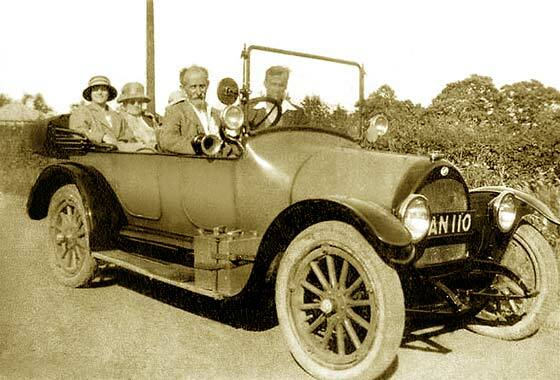 Poor photo posted on the AACA website by Chris saying "Can anyone identify car in photo? The date is July 1908. I would be most interested to find out. While it has nothing to do with the car, the people around it are the crew of ''Cobweb'' (an 8 metre) and are about to win the Gold Medal for Britain in the world's first yachting Olympics, at Ryde. -- Suggested that it may be a British Crossley but we are relatively sure from rad and badge this is a Paris made cca 1907 Darracq 16hp Tourer. 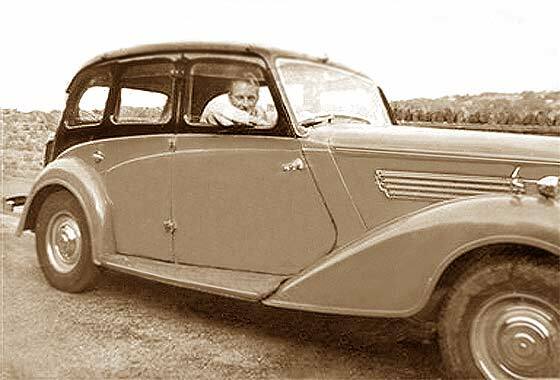 Photo received from Deepak Dev Burman (India) of a car that belonged to an Indian King in the Tripura State in India. He approximates the year of use as 1925-1935. The car is no more, did not survive ! 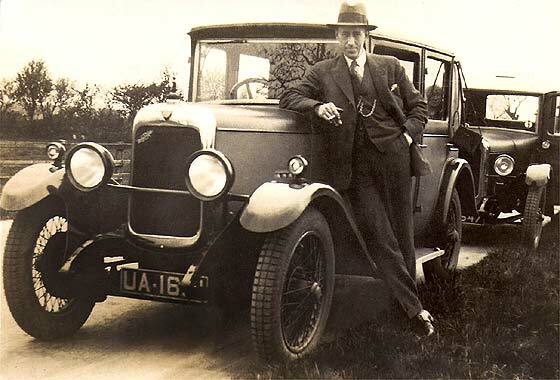 He thinks it may be a Humber 1920 Tourer. -- Regret it is not a Humber nor is it 1920s. The photo is a little fuzzy but we are relatively sure this is a French car built in Lyon. From the wider rad surround this seems a cca 1908 Berliet C2 22 hp. - But if owned by a king, it may be a 40 or 60HP? 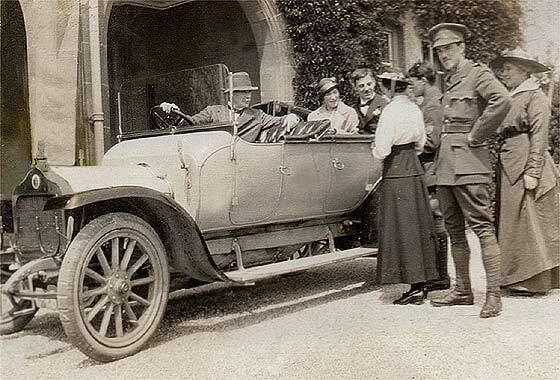 Photo received from Vanya Hoeffding (USA) hoping we can identify car belonging to great-grandfather, architect Walter Aubrey Thomas (driving), at great-aunt's marriage in Cheshire 1915. -- The registration is not visible but the car has gas lighting and an RAC badge. The radiator top and badge have distinctive styling saying this is a Belgian made cca 1911 Minerva Type X 24 HP Open Tourer probably obtained from the UK Agent, Honorable Charles S Royce, UK being Minerva's largest market. 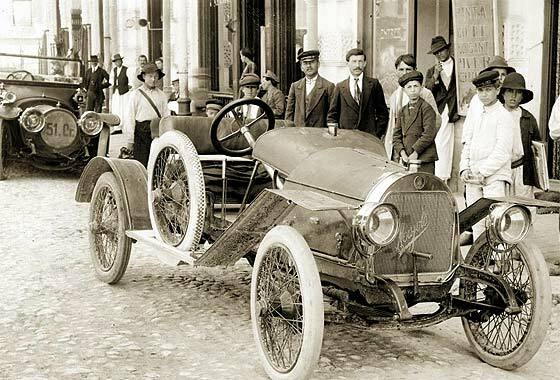 A photo which appears to be a scan of a newspaper cutting received from Rafael Diaz Naval from Santa Cruz de Tenerife (Canary Islands) saying he needs identification of this car which seems from the '1910 year'. -- The photo is just simply not good enough to be able to make a definite identification. 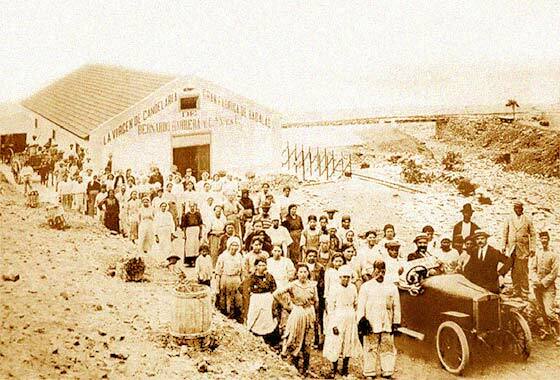 As the Canaries were a Spanish province one is tempted to see this little car with angular mudguards as a cca 1911 Hispano Suiza Alfonso Two Seater, -which did not have wooden wheels? Another photo received from Adrian Pascu-Tulbure (UK) relating to an item on historic cars of Romania in a Romanian newspaper. Taken pre-1916 in Caracal, Romania. Is it a Majola? -- Lovely photograph with the Majola logo on the radiator honeycomb. Majola cars were built in St Denis, north Paris. 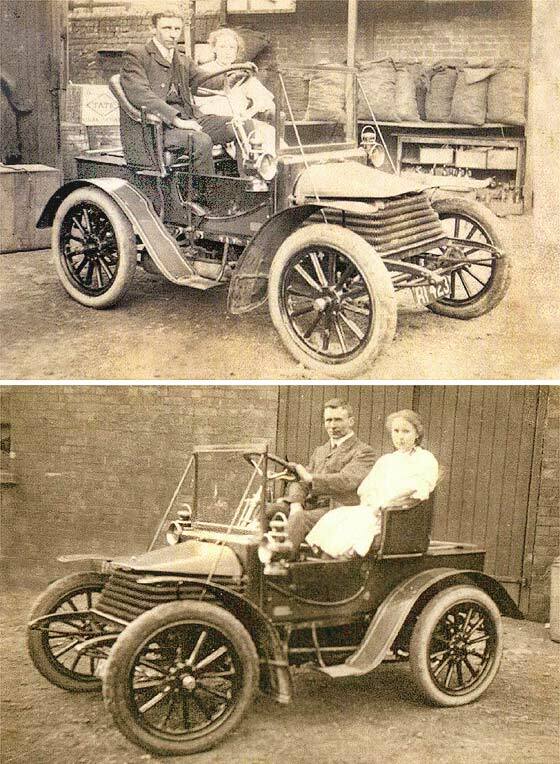 They made two models with similar radiator and badge, 1911 to '14. 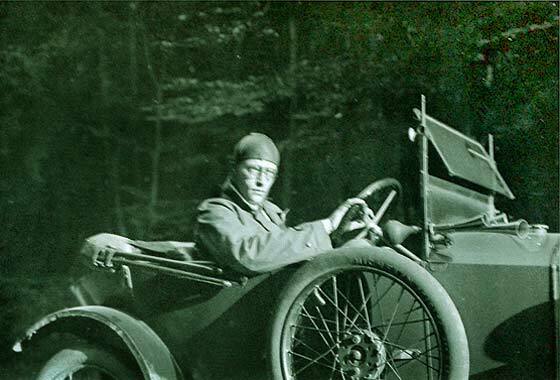 Similar fronted car was driven by designer Maurice Doutre in 1912 Tour de France. Became Georges Irat 1920, & new rad. A rather faint photo received from Jerry Burley (UK) saying this has just appeared in a box of old family photos during a clearout. It might be a relative but they are not sure who, what or where this is. Our help much appreciated. -- We have slightly enhanced the photo. Registration LW 6#72 was issued by London County Council in June 1919, but the car was was made before WW1 and stored for the duration. This is a two cylinder cca 1914 Swift 7HP Cyclecar Two Seater, still with gas lighting. 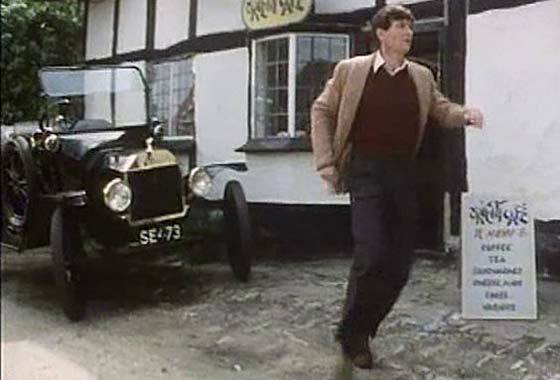 Cinema screen grab of a vehicle which appeared in an British TV film " Why Didn't They Ask Evans?" made in 1980 where the vehicles are being investigated by IMCDB. The film is based on Agatha Christies 1934 murder mystery. -- Transverse spring identifies it as a Ford T. Registration SE 437 is Banff CC in Scotland but difficult to say if genuine or new 'age related'. Dating of car is easier from the angular radiator, and it has electric lighting. The car is a cca 1915 Ford Model T Touring. Photo received from Tom Cunliffe from Seaford (UK) asking if we can help him identify a car from the attached photo. It belongs to a relative of a friend in Seaford and they have drawn a blank with numerous Google Image searches. -- The interesting part about the photo is the number AN 110. This is a West Ham (London) registration of cca 1904 but car is a cca 1919 Overland 90 Four Tourer so probably a 'cherished plate'. Body looks British and Overland had a tie-up with Crossley 1919. Photo received from Lisa Dresserb (USA) who is trying to identify the car shown in the attached image. The man in the driver's seat died in August 1928, so the picture was definitely taken before then. -- We note the enquiry was also sent to the AACA. 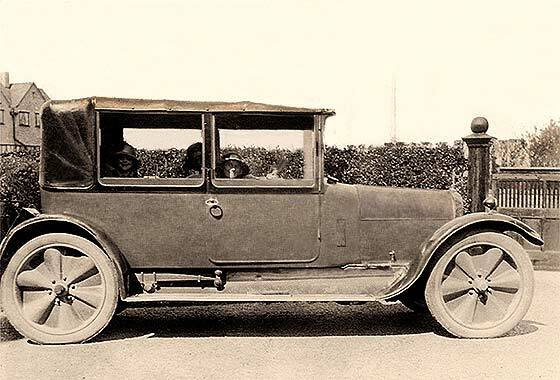 While we agree with the suggestion of the make, from curved rad top, the shorter louvers and squarish skirt, big rear brakes and smaller windscreen frame mount, we feel this is a cca 1919 Studebaker Light / Special Six EH 19'20 Touring. Fascinating photo sent to one of our expert contributors (UK) saying the photo has resided in Scotland for some considerable time but nobody knew what the car was. -- All pointers, bar slightly shouldered radiator, suggest this is a very unusual British car and well worth mentioning in these pages. Cantilever springs, double scuttle filler caps, the wavy disc wheels and body, all say cca1920 Angus Sanderson 14 HP with standard factory Allweather body. Only about 3,000 A-S cars built. 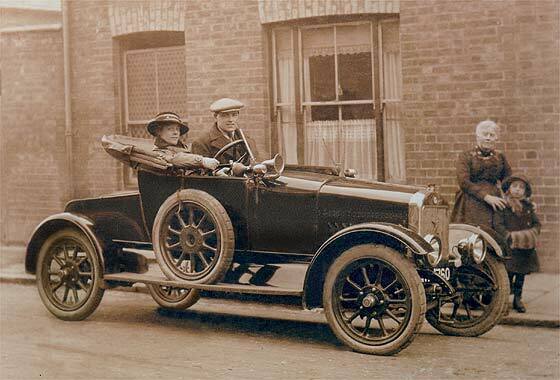 Photo submitted by Colin Mitchell (UK) of grandparents in possibly a Cluley 10-4Hp taken before 1927 in Northampton where Grandmother was first lady to hold driving licence. Can we confirm it is actually a Cluely because it does not match in some respects. 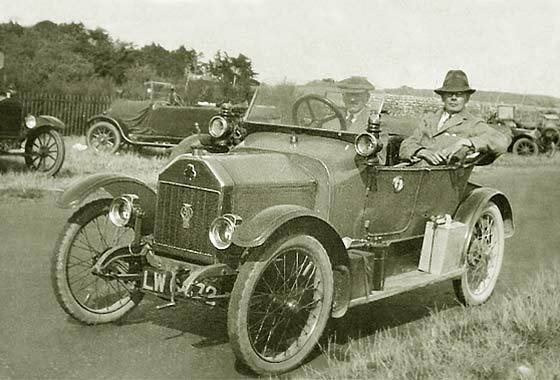 -- Regret not a Cluley as this is a cca 1919 Hillman 11HP Two-Seater with Dickey. Hillman started in 1907 in Coventry, made the popular 9HP 1913, which became 11HP after WW1, with 14HP in 1925. Became Humber in 1929. Photo received from Sigurd Volker (Germany) who told his father in law (82) about "our incredible site" when he mentioned his father's first car, the make of which he has forgotten. He provided the attached photo by mobile phone, so is a bit small and blurry. Can we help? -- Presumably the photo was taken in Germany so it is a little surprising to find this is a French car. This is a cca 1923 Peugeot Quadrilette, RHD and is probably later side-by-side seating type 172, of which 8,000 were made 1923/4. Tiny photo received from Nathan Leadbetter (USA) saying " I came across a photo of Adolph Hitler standing next to a car, probably late '20s, which looks like a Mercedes L, but there are several things off. Can you advise. Thanks for running a great site! -- Not a Mercedes but a Benz, being big competitors until they merged in 1925. 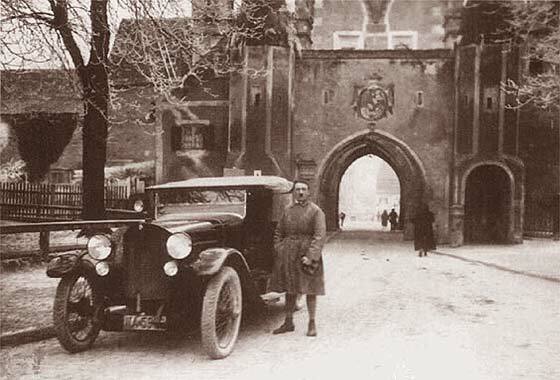 Photo of Hitler is on release from Landsberg Prison 1924 next to what seems his then preference, a basic cca 1924 Benz 11'40 Tourenwagen bought on credit ! 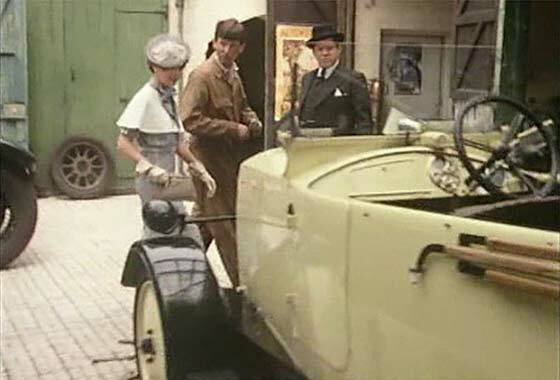 Cinema screen grab of a vehicle which appeared in an British TV film " Why Didn't They Ask Evans? " made in 1980 where the vehicles are being investigated by IMCDB. The film is based on Agatha Christies 1934 murder mystery. -- Peculiarly British car this is a cca 1925 Trojan Utility Tourer designed by Leslie Hounsfield and 16,000 made for him by Leyland Motors in Kingston-upon-Thames. Engine was started by pulling a lever next to the driver. Sales slogan was " Can you afford to walk?" 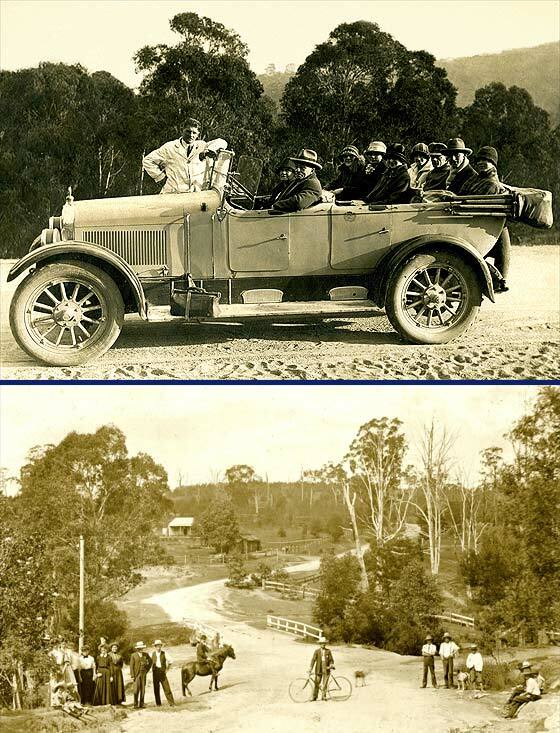 Lovely photo received from Ron Glenister (Australia) saying "Photo was taken in the 1920's 'On the road to Jonalan" near Sydney, Australia. Would be grateful if you could identify the vehicle. Love your site." --The first photo had no car but is lovely, so attached. The second photo shows a very large American Tourer with 10 people aboard. Made in Cleveland, Ohio, this is a cca 1926 Chandler Model 35 7-place Tourer. 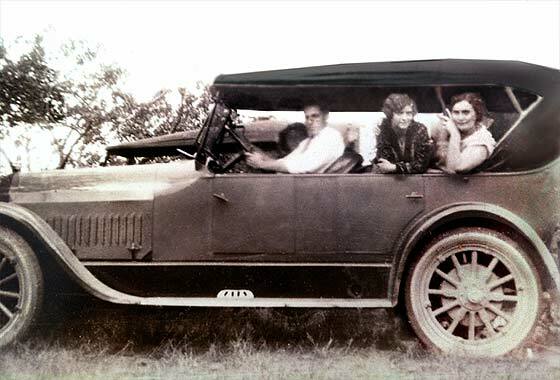 The Chandler-Cleveland Motor Corp was bought in 1928 by Hupp Motor Corp.
Photo submitted by Jayne Shrimpton (UK) dress historian and regular columnist for Practical Family History magazine saying" I wonder if you could help with this car photograph please? The owner of the photo says Leeds registration but can you suggest a date range please; probably early 1920s, based on the dress, but the car might clinch it. -- Indeed Leeds County Borough Council, late '27/early '28. This is a quality car built in Coventry being a cca 1927 Alvis TA 14.75 Alvista Fabric Saloon. Another puzzling photo received from Adrian Pascu-Tulbure (UK) which he has been pondering for ages. Almost definitely coach-built but he has no idea on what! Many thanks. -- This has taxed all our experts and we have not come up with a positive identification. It has a European look with some American features to confuse. 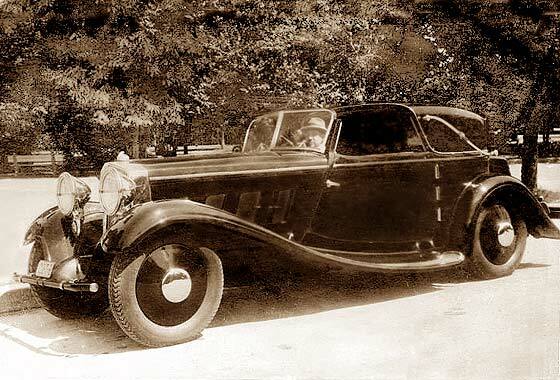 Going out on a limb, I suggest this could be a coachbuilt German cca 1933 Maybach Zeppelin DS8 Coupe de Ville, possibly bodied in America, as has lots of hinges? 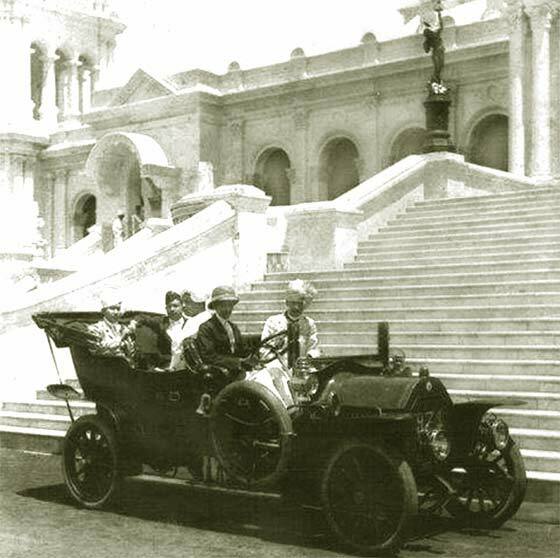 Photo received from Mansoor Aziz Ahmed (Pakistan) of a car that is supposed to be a Rolls belonged to the Nizam of Hyderbad. Obviously not a RR, perhaps Fiat? -- This photo has been on the net for years and currently lampoons Rolls Royce because of an apparent insult to the Nizam in London, who then bought six and used them as garbage trucks. The photo is of a cca 1934 Ford Model 40 V8. 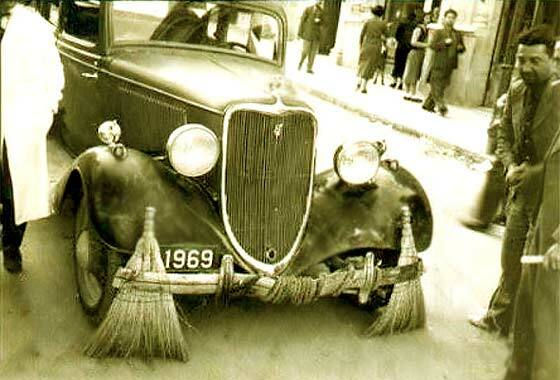 Alternatively, photo is also claimed to have been taken in Baghdad, Iraq, - as a street cleaning car. Very grainy and out of focus small photo received from Patricia Lewis (USA) saying " I hope you can help me identify this car. 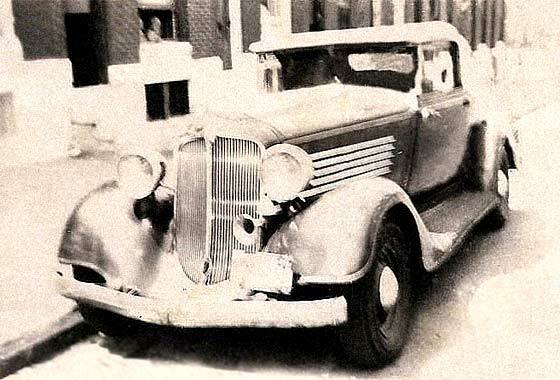 The car belonged to Martin Price Jones who lived in Baltimore City, Maryland, USA. He was my father. Unfortunately, he is deceased and I found the photo after his death. -- We have had a go at repairing the photo which shows up clearly five bonnet louver bars which were the trademark, for a couple of years, of cca 1934 Chrysler CA Two Door Convertible Coupe. Photo received from Ashleigh Roberts (UK) of his dad in a car, but he cannot work out what the cars is. The photo was taken about 1930, probably in London. Cannot see see the font of the car but the full side and the shape of it is visible. Dad was then about twenty-ish, and before he moved to Liverpool. Can we help? 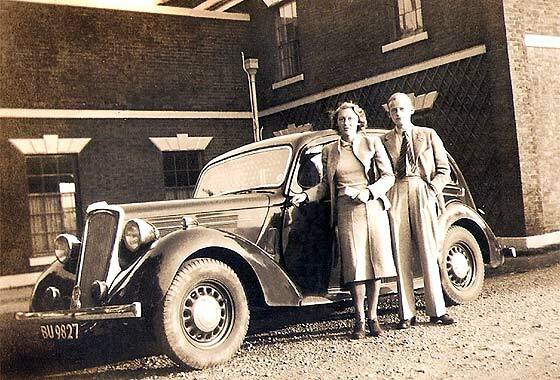 -- The shape is very much a cca 1936 Wolseley Super Six Saloon which were made 1935 to 1937. These were an up-market Morris and were available as 16, 21 and 25HP. Photo received from Roy Edgar (UK) saying " You have been terrifically helpful on previous requests and I am hoping you can identify this Oldham-registered car, photo also showing my mother and her brother. -- The registration is indeed Oldham CBC late 1936. The car was built in Coventry by a company founded in 1903 by Reginald Maudslay who insisted the cars were built to 'the best possible standard'. Bonnet louvres say this is a cca 1939 Standard Flying 12 Saloon, costing £299. Photo received from Chris Fussell (UK) saying " I came across this radiator cowling in some junk and I was wondering if it could be identified as to what vehicle it came from. Measure 31" X 18" X 4 3/4" and is made of brass. There is an elongated octagon insert to take a badge on front top." -- The octagonal badge recess really gives the game away as the shape was relatively unusual but at the same time well known. 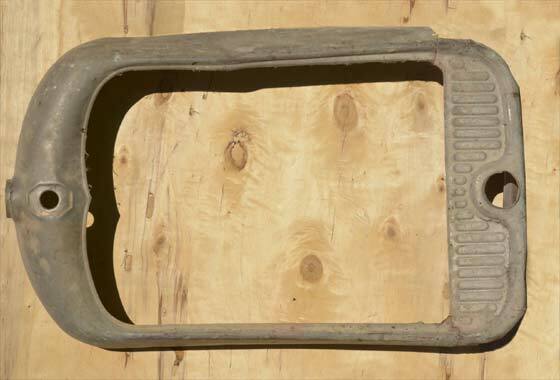 This surround is from early cca 1928 Citroen C4/C6 vehicle.